With over 1.3 million pets insured and 42 years of experience helping to ensure the health of pets, we reveal the most common health problems affecting horses. Petplan Equine paid out over £12.4 million in claims in 2018. 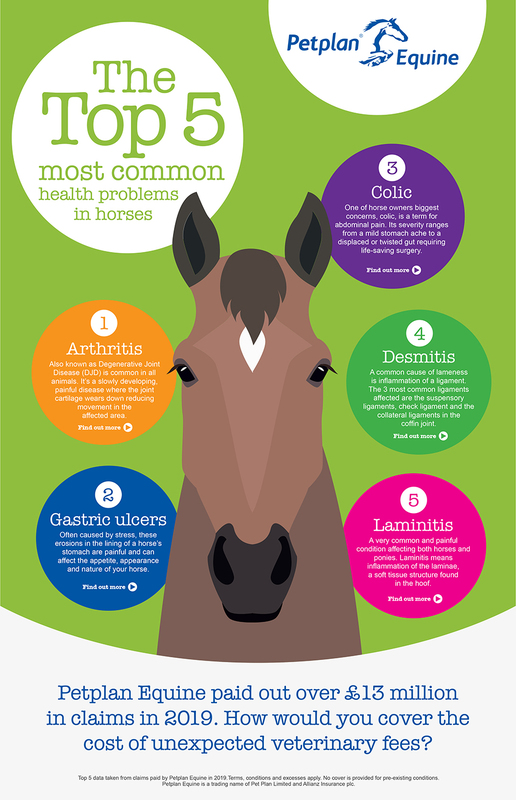 Find out the top 5 most common health problems affecting horses, how to spot the signs and top tips for horse owners below. Gastric Ulcers are generally small erosions in the lining of the stomach which are painful and can affect the appetite, appearance, demeanour and riding experience of your horse. How can I help prevent Gastric Ulcers? Gastric Ulcers are most commonly associated with psychological stress and therefore minimising this offers the best assurance your horse will not develop them. Make sure your horse is not going for prolonged periods without food, that it is turned out on a daily basis and in a field with other horses with whom it 'gets along', that his exercise regime is measured and consistent and that any changes to management or exercise are phased in gradually and not drastically. Feeding a high proportion of the diet as forage also ensures the acid in the stomach is buffered in contrast with excessive quantities of hard feed which predispose to high acid levels and accordingly damage to the stomach lining. What can I do if my horse is suffering? Diagnosis of gastric ulceration is made by your vet performing a gastro scope. A scope is passed down the food pipe to look at the stomach lining. Management and feeding adjustments should be made as your vet advises and your horse will be put on a daily dose of Omeprazole, an excellent treatment that can lead to a full resolution of the ulcers within 4 weeks. Consider taking out horse insurance to help you pay for treatment if your horse becomes ill. Unfortunately colic is a condition that many horse owners experience. Having had horses all of my life it’s one of my biggest concerns and something I’ve had many dealings with. My first and most tragic colic experience was with my horse Moscow, an ex-racehorse who developed colic which resulted in him having surgery. Then a year after his operation he had it again and this time there was nothing to be done. In his case there seemed to be no trigger for the colic, Moscow was a young (6 years old) fit and otherwise healthy horse. The most frightening thing for me was that colic seemed to affect my horse out of the blue, with no obvious cause and escalated rapidly. In this instance I sadly lost Moscow but it did make me more aware of any management techniques to possibly avoid a potential colic episode. My old pony Ash had a few episodes of spasmodic colic last summer and again, there was no obvious reason for this. In the sixteen years I have had him this is the only time he had shown any signs of colic. Thankfully he was treated quickly by my vet with an injection of Buscopan and all was well soon after. If you have any suspicion of colic time really is of the essence! Due to my devastating experience with Moscow I am now very quick to recognise the signs, there should be no delay to call the vet when colic is suspected and thanks to Petplan Equine I genuinely can feel secure financial help is at hand should I need it. When I realised that Teddy my main competition horse seemed to be prone to colic type symptoms I spoke to an independent nutritionist to see if I could change his diet in any way. I also spoke in length to my vet about gut health and researched which supplements might benefit Teddy best. I’ve certainly learnt a lot from my experiences with colic. All horses are different and knowing what is normal or abnormal behaviour for your horse is so important in recognising the early signs of colic so you can get veterinary help and hopefully have the best chance of a good outcome. Colic is the name given to abdominal pain in horses. Ranging from a mild stomach ache to a displacement or twist in the intestine requiring lifesaving surgery, colic is one of many horse owner’s biggest concerns. How can I help prevent equine colic? 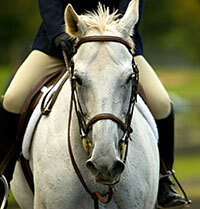 Osteoarthritis, also known as Degenerative Joint Disease (DJD), is common in horses, humans, dogs and many other animals. It's a slowly developing disease in which the joint tissues become inflamed and the joint cartilage is damaged and worn down. Arthritis is very painful and reduces the range of movement in the affected joint. How can I help prevent arthritis in my horse? Osteoarthritis is caused by "wear and tear" over a number of years, most usually in those horses that have had regular "hard work". Below are some tips to reduce the likeliness of arthritis in your horse. There is no absolute cure for osteoarthritis but there are a number of ways of managing the condition and reducing the pain it causes. 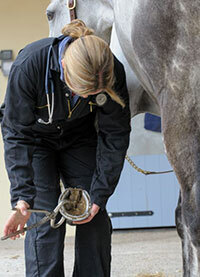 Laminitis, a painful and debilitating condition affecting the horse's feet. Laminitis means inflammation of the laminae, a soft tissue structure found in the hoof. How can I help prevent laminitis in my horse? It is every owner’s worst nightmare when they hear that their horse has an injury which might mean they may never come sound or return to work. Especially when the horse is purchased only six weeks prior to the injury. Sadly this was the situation I faced, in the October of 2013. I bought Finley as a five year old from a lady who had purchased him only three months earlier from the Ascot sales. He was a 17hh ex racehorse from Ireland, who was incredibly green but moved well on the flat and was extremely handsome! He started off as a bit of a handful, and I could tell that he was of quite a nervous disposition and panicked easily, so we took things slowly. Even doing this, and not knowing him that well I felt something wasn’t right. He found it particularly difficult to canter on one rein; which I put down to him being quite one sided and the lack of schooling. But, soon after he became lame. There was no heat or swelling present in the leg or foot so I proceeded to seek veterinary help. I have been using Pete Gallon from Liphook Equine Hospital to treat all my horses for many years, and he knows both them and me very well. After a lameness work up which involved nerve blocks, bone scans and ultrasounds Finley was diagnosed with Proximal Suspensory Desmitis. As a veterinary nurse myself, I have a medical background which unfortunately can have its downfalls when it comes to your own animals and having the knowledge and understanding of how serious a condition can be. The vet explained that the damage to Finley’s tendon was pretty bad, and there was a strong chance that he may never return to work and become the event horse that I had hoped he would be. We discussed in detail a treatment and rehabilitation program for him in order to give him the best possible chance. I knew that all of this was going to come at a great cost; and was so thankful that I took out insurance from the day I bought him. Petplan Equine were great from the moment I knew Finley would be needing treatment. They were incredibly efficient with settling his claims, and covered everything from the diagnosis, treatment, complimentary therapy, and shoeing. This meant I didn’t have to worry about paying the veterinary fees, and could concentrate on getting Finley better with the best care possible. Finley received multiple sessions of shockwave therapy on his injury, as well as strict box rest. I was made aware of other available treatment options such as platelet rich plasma and surgery, but luckily I did not need to do this. In time Finley was able to be led out in-hand increasing the work load slowly on his leg. After six months of box rest my incredibly patient and well behaved horse was starting to become miserable and moody. It was still unknown whether he would become completely sound but I couldn’t bear to see him losing his spark. So my gut instinct was to turn him out and keep my fingers crossed for a miracle. We continued the rehab program which now included remedial shoeing from my fantastic farrier. Finley’s feet were very misshapen so this needed correcting in order to bring the heel up. We also worked closely with the horse’s chiropractor Emma Roberts as Finley had now lost all his muscle and was a blank canvas to strengthen and build correctly. Finley’s exercise needed to be in straight lines and luckily I have a fairly flat field to do this in so I was able to progress the trotting and cantering without being in the school to make sure we had even loading on both front legs. As his work load increased I became one of those neurotic owners that checked their horse’s legs morning, noon and night for heat and swelling; before and after exercise! Despite my ‘crazy’ behaviour he continued to improve and in 2014 a year after his injury he competed in his first horse trials at 70cm. Three years on and Finley has gone from strength to strength and so has our partnership. We had a successful 2016 competing at BE100 with a clean sheet cross country and a second place in our last event. The 2017 season has started with us competing in our first BE Novice, which was my goal for the year, and we have now achieved! I honestly never thought that this would ever happen. I know that the early diagnosis of PSD helped aid Finley’s recovery, and I am so grateful for this. It is also important to follow the advice given by the professionally trained, as I know that Finley’s full recovery came down to a fantastic team of people and their expertise; that supported me in doing the best for my horse – I cannot thank them enough. Desmitis in horses is a condition owners may be less familiar with. However; horses suffering from this condition is surprisingly high. Desmitis means inflammation of a ligament, usually in the limbs where it is a common cause of lameness. The three most common ligaments inflamed are the suspensory ligament, the check ligament and the collateral ligaments of the coffin joint. The top tip is to "know your horse"; Suspensory desmitis can often "creep up" without obvious lameness. If your horse's behaviour or performance changes (he becomes better on one rein, transitions are not so smooth or his back becomes tense) these are signs that he may have suspensory desmitis in the hind limbs. How can I help prevent my horse suffering from desmitis? 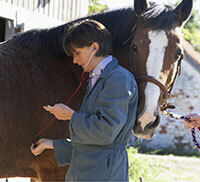 Once diagnosed there are various treatments for desmitis depending on the severity and cause of your horses swelling. Box rest with a disciplined walking out programme for 6-8 weeks is the most common start to the rehabilitation process. 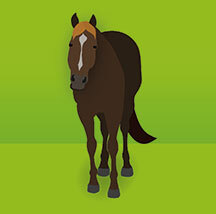 For more tips and advice on caring for your horse visit the Petplan Equine Horse Advice tab.